BHU's unsettling projection of reserved teaching jobs under the new UGC formula has been cited by the central government in its Special Leave Petition filed with SC last month. POSTS RESERVED for Scheduled Caste (SC) candidates will be reduced by half, those for Scheduled Tribe (ST) by almost 80 per cent and for OBC teachers by 30 per cent. 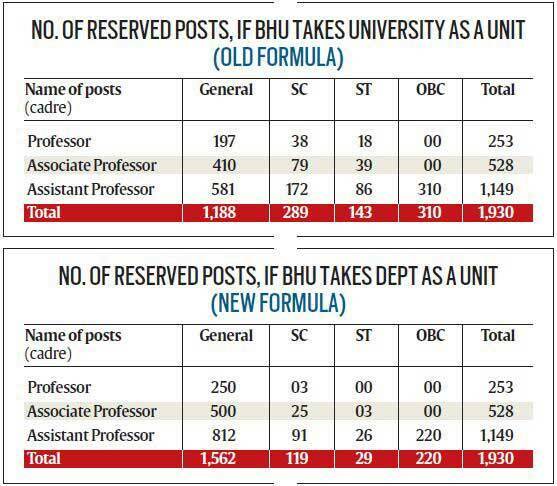 This is the unsettling projection made by Banaras Hindu University (BHU), Asia’s largest residential varsity and among India’s top ten institutions, if it were to implement the UGC’s new formula for calculating reservation in teaching jobs. According to data shared by the university administration, there were 1,930 faculty posts on May 12, 2017. If the institution were to implement reservation based on the old UGC formula, taking the university as a unit, 289 posts will be reserved for SCs, 143 for STs and 310 for OBCs. Under the new formula, which takes the department as a unit, the number of reserved positions drops to 119 for SCs, 29 for STs and 220 for OBCs. The central government has cited BHU’s projection in its Special Leave Petition (SLP) filed with the Supreme Court last month to endorse its case that the Allahabad High Court judgment, which paved the way for the new UGC formula, “drastically reduces, and, in many departments completely wipes out, the representation of members of SC/ST community”. On March 5, the higher education regulator had issued a notification announcing that the number of reserved faculty posts across universities and colleges shall be calculated department-wise and not based on the aggregate vacant posts in a university. The change, first reported by The Indian Express on October 23, 2017, was based on a verdict of the Allahabad High Court in April last year. While hearing a case on teachers’ recruitment in BHU, the court held that reservation in teaching posts has to be applied department-wise by treating the department and not the university as a “unit”. Following a furore over UGC’s order, the government had decided to file a SLP against the Allahabad High Court verdict in the Supreme Court. Although the UGC has informed all higher education institutions about the HRD Ministry’s move to approach the top court, it hasn’t withdrawn its March 5 order yet. According to sources, the regulator hasn’t done so for the fear of being held in contempt of court. Reservation based on department or subject as a unit, according to the notification last month, means that departments with single post cadres — usually the position of a professor — will be outside the purview of reservation. Citing an example using the new formula, experts say departments with two or more faculty posts, but less than 15 in a cadre, will have only one reserved for an SC candidate at serial number 7 and for an ST candidate at serial number 14. So if a department has only six associate professor-level posts, none will be reserved for SC and ST candidates. Reservation will only be implemented through rotation, which experts say could take years.